Every church today has rules and regulations, things forbidden and things allowed, that are not specifically written in the Bible, but are extrapolated from it. Thus leaders in a church today might “bind,” forbid, specific immodest clothing in the worship service based on the general tenet of Scripture that people dress modestly. Or, specific foul language might be “bound,” forbidden, on church property based on the general biblical rule about not using obscenity. The Jewish faith in Jesus’ time was no different than our modern churches, and the leaders imposed many rules and regulations that were not specifically written in the “Law,” the “Torah,” which is the first five books of the Hebrew Scriptures [Gen. through Deut.]. Although the Hebrew word “torah” has been translated into English as “law,” that is not its actual meaning. What it really means is “instruction.” The Brown-driver Briggs Hebrew Lexicon5 gives the first definition of torah as “instruction,” and the second definition as “law (properly, direction).” The point of the Torah (Instruction) is to give specific rules and examples that can then be used as the basis for general instruction about life. Thus, the basis of Torah study is similar to American case law. For example, when it comes to building buildings, the Torah states that a person who builds a house has to put a railing around the flat roof so the people do not fall off (Deut. 22:8). The Torah cannot list every possible building regulation, but it can show by a clear example that houses should be built in a manner that is safe for the occupants and visitors. Thus, the “Book of Instruction” teaches the general principle that people must build safe buildings by using a specific example. Since there were many specific situations that were not written about in the Torah, the rabbis had to make lots of rules to cover individual cases, and they “bound” (forbid) or “loosed” (permitted) activities based on their interpretation of the Torah. Some of their interpretations were correct, while some were incorrect. For example, the Torah said not to work on the Sabbath day (Exod. 20:8–11), but it never defined which activities were work, so the rabbis had to make judgments about it. They decided that walking more than 2000 cubits (about one-half mile [about 0.8048 kilometer]) was “work,” and they “bound,” forbid, anyone from walking further than that on the Sabbath, which is why the Bible uses the phrase, “Sabbath day’s journey” (Acts 1:12 KJV). No one in Scripture ever challenged the rabbis’ decision on that issue. However, the rabbis decided that healing on the Sabbath was “work,” and they “bound,” that too. Thus, when Jesus healed on the Sabbath, the Synagogue ruler said, “…There are six days for work. So come and be healed on those days, not on the Sabbath” (Luke 13:14). Jesus ignored that ridiculous interpretation of the Torah, and called the religious leaders “hypocrites.” Notice that Jesus did not say that the leaders were wrong for trying to apply general teaching of the Torah to specific situations not mentioned by Moses; he said their interpretation about healing was wrong. We as Christians need to learn from the rabbis and Jesus. We assert that the Bible is our rule of faith and practice. But the Bible, like the Torah [Gen. through Deut. ], does not cover every situation that comes up in Christian life and leadership. What does a Christian do when the Bible does not specifically address the situation the leader is facing? We must use the Bible like the rabbis used the Torah. We must learn from it and then apply the lessons we have learned to the situation we are facing. We must bind (forbid) or loose (permit) activities based on our best understanding of the Bible. We must be humble and wise, because as Jesus taught us, we are responsible for the decisions we make. Our rules may be good and helpful, or, like the rabbis forbidding healing on the Sabbath, they may be hurtful. As leaders over God’s people, the Lord will judge us for what we forbid and allow. 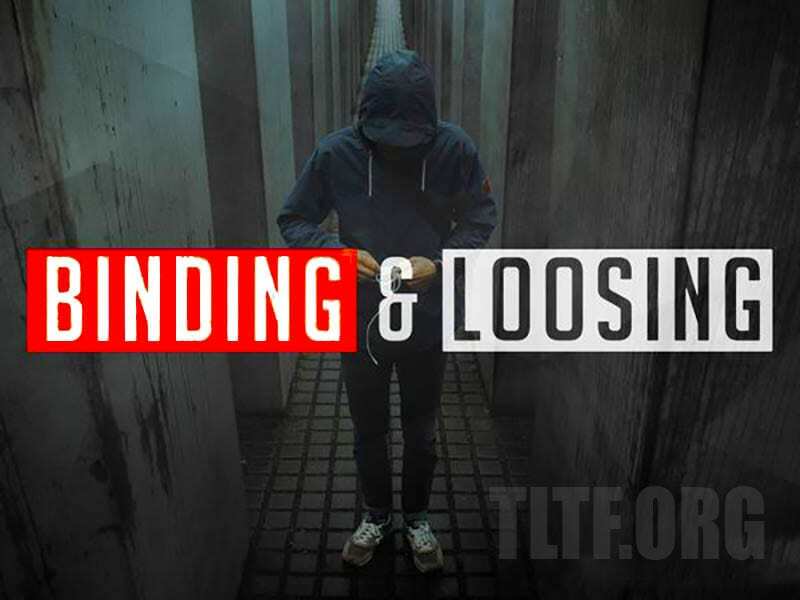 Once we realize that “binding” and “loosing” were common terms for “forbidding” and “permitting,” it becomes clear that there are many things every leader must forbid or allow. In fact, given the frequency in which binding and loosing appear in the Rabbinic writings, it is somewhat amazing they only appear twice in Scripture. After all, the Rabbis bound and loosed all sorts of things that are mentioned in the Gospels, including “binding” people from eating with unwashed hands (Mark 7:3), or from picking grain on the Sabbath (Matt. 12:1 and 2). Meanwhile, they “loosed” a person from having to support his parents (Matt. 15:3–6), and “loosed” the profiteering going on in the Temple, as greedy people sold animals and changed currencies in a manner that took advantage of the people, something that aroused Jesus’ ire (John 2:13–16). Now that we know that the word “bind” means “forbid,” and “loose” means “permit,” we need to properly translate the verses that contain them. Almost every English version translates Matthew 16:19 and 18:18 in a way similar to the NIV: “I tell you the truth, whatever you bind on earth will be bound in heaven, and whatever you loose on earth will be loosed in heaven” (Matt. 18:18). According to this translation, we, as disciples, make a decision to bind or loose, and God then follows our lead. This translation has produced wrong doctrine in the Church. For example, the commentator Albert Barnes, author of the well-known commentary set, Barnes’ Notes, writes: “The meaning of this verse is, whatever you shall do in the discipline of the church shall be approved by God….”6 That is not a correct interpretation of the verse, and not the way ministry works. The Greek text in the phrase that most versions translate as, “will be bound in heaven” does not have a simple future tense, as “will be” implies, and the verb “bind” is passive in the Greek text, so “shall have been bound” or “must have been bound” are good translations of the Greek.8 An excellent translation of Matthew 18:18, was done by Charles Williams. There is a trend today in Evangelical and Charismatic Christianity to try to “bind” and “loose” demons. This usually happens in the context of healing or deliverance sessions. The Christian Scriptures clearly teaches that a minister of the Gospel has power over demons. However, at no time in the Christian Scriptures does Jesus, Peter, Paul, nor any other minister ever “bind” or “loose” a demon. Remember, in the culture, binding and loosing referred to things, not people, and not demons. Furthermore, the context of the verses that use “bind” and “loose” have nothing to do with demons. The vocabulary about binding and loosing was already common before Jesus started his ministry, and Jesus was the first man in history to regularly exercise authority over demons, so the binding and loosing vocabulary could not have developed in reference to demons. 1. A. T. Robertson, Word Pictures in the New Testament (Baker Book House, Grand Rapids, MI, 1930), p. 134; comment on Matthew 16:19. 2. Adam Clarke, Clarke’s Commentary (Abingdon-Cokesbury Press, New York), Vol. 5, p. 184, note on Matthew 18:18. 3. Horst Balz and Gerhard Schneider, The Exegetical Dictionary of the New Testament (William B. Eerdmans Publishing Company, Grand Rapids, MI, 1990), p. 293. 4. John Lightfoot, A Commentary on the New Testament from the Talmud and Hebraica: Vol. 2, Matthew -1 Corinthians (Hendrickson Publishers, Peabody, MA, originally 1859, reprinted 1979), pp. 236-241; notes on Matthew 16:19. 5. Brown, Francis, with the cooperation of S. R. Driver, and Charles A. Briggs. The Brown-Driver-Briggs Hebrew and English Lexicon (Hendrickson Publishers, Peabody, MA, Sixth Reprinting 2001). 6. Albert Barnes, Barnes’ Notes (Baker Books, Grand Rapids, MI, 1847, reprinted 2005), p. 188, note on Matthew 18:18. 7. Scripture quotations marked (NASB) are taken from the New American Standard Bible®, © 1960, 1962, 1963, 1968, 1971, 1972, 1973, 1975, 1977, 1995 by The Lockman Foundation. Used by permission. 8. The “to be” verb in Matthew 18:18 is a future passive periphrastic perfect indicative. A. T. Robertson, Word Pictures in the New Testament (Baker Book House, Grand Rapids, MI, 1930), p. 149. 9. The New Testament: A Private Translation in the Language of the People, Charles B. Williams (Moody Press, Chicago, 1960). 10. Mantey’s quotation is on the flyleaf to The New Testament by Charles B. Williams. 11. A. T. Robertson, Word Pictures in the New Testament (Baker Book House, Grand Rapids, MI, 1930), p. 134; comment on Matthew 16:19.